New Records Set by 40 Days for Life-Dallas - Thanks to all who helped make it happen! Breaking Pro-Life News: Baby 7 Billion Welcomed! Sunday night marked the conclusion of the 40 Days for Life-Dallas 2011 Fall campaign. During these 40 days, over 6,000 people took to the sidewalks in prayer for the unborn and all those affected by the tragedy of abortion. 23 abortion-bound women chose life for their children at the vigil location - Southwestern late-term abortion center, plus 92 additional lives were spared at the 4 other Dallas abortion centers where the power of your prayers was felt. 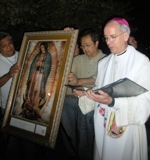 The final hour of prayer reflected these beautiful blessings with a prayer service lead by Bishop Mark Seitz in honor of Our Lady of Guadalupe -- Patroness of the Unborn -- whose pilgrim icon was present at the vigil site. The following evening, St. Thomas Aquinas hosted a Victory Celebration opened by Bishop Seitz, followed by the powerful post-abortive testimony of Katharine Hill with LifeTalk Resource Center and the inspirational call to action by former abortion provider, now pro-life advocate Carol Everett. Attendees also enjoyed a breathtaking concert by world-renowned musician Eric Genuis. It was a fitting end to a truly amazing campaign. Check out the photos here! This campaign would not have been possible without the dedication of all you, Friends of Life, who came to pray and encouraged your parishes and organizations to do the same. We'd like to extend a special thanks to the volunteers who helped lead and plan the campaign, the Knights of Columbus and the rest of the "night crew" who made sure the vigil was covered 24/7, St. Francis Anglican Church which hosted campaign meetings, and many, many more who selflessly gave for God's precious ones. Read more about campaign experiences here. Voices 4Life is sponsoring a young adult (21+) trip to experience the thrill and excitement of marching with half a million pro-life friends at the National March for Life in DC. Possible activities will include attending the Cardinal O’Connor Conference for Life, touring D.C., the March for Life and much more. Visit prolifedallas.org/voicesmarch for more information and to register. Breaking Pro-Life News - Baby 7 Billion Welcomed! The United Nations designated October 31st as the date on which the world's population would pass the 7 billion threshhold. On Vatican Radio, Father Lombardi delivered the following insights on the momentous occasion of the birth of the 7 billionth baby. Dear baby number seven billion! I don’t know if you are a girl or a boy, whether you are Indian or Chinese, born in a great city or a tiny village. I don’t know if you were born in the fertile South American lowlands or under an igloo above the arctic circle. I don’t know if you were born on a remote island, or in a refugee tent. I don’t know whether you are healthy or sick or handicapped. I don’t know whether both your parents were there to embrace you at your birth, or whether your mother alone was there to hold you. I don’t know whether people will say there are too many or too few of you and your contemporaries. Today, I don’t care about that. This world you are coming into is a bit complicated and it’s not friendly for everyone. We haven’t done a very good job preparing it for you. The leaders of the richest and most powerful nations are sitting around a table, struggling to find a way forward. We too are asking ourselves about your future.But today I want to tell you that you are unique and special, that you are a wonderful gift, that you are a miracle, that your spirit will live for ever, and so you are welcome. We hope that when you smile someone will respond to your smile, and when you cry someone will caress you. We hope you can go to school and that you won’t go hungry. We hope that someone will answer your questions wisely and encourage you as you find your place in the world. We hope you will be able to love others, that will be able to grow, and work, and live among your family, with many friends, in a nation and in a world that is free and at peace. We pray that you can understand that your life will find its fullest meaning not in this world but in the next. Because this is what you were born for. Your Creator and Father made you for this. We will do our part to make this possible; but you will have to do your part, too, because your future will also depend on you and the choices you make—and it will be up to you to welcome baby eight billion.